Outcasts Blu-ray Review Outcasts fails to live up to a premise that should have been thrilling and rife with drama from the outset. Set in the year 2060, the Beeb’s latest jaunt into science fiction takes place on the distant planet Carpathia, where the last remnants of humanity have gathered following a nuclear holocaust on Earth. The premise of humanity fleeing a ruined Earth and colonising a distant solar system is an unoriginal but fascinating one, and resonates particularly in a modern human psyche wearied of war, the threat of nuclear tyranny, the destruction of the environment, and so on. The actual execution of Outcasts is, however, somewhat lacking, and what could have been one of the sci-fi standouts of the last decade frequently descended into a morass of boring exposition, bland characterisations and equally uninspiring plot developments. Viewers in its native UK evidently agreed, with ratings plunging by two thirds over the course of the show’s 8-episode run and the BBC, after relegating the series to Sunday nights from its previous primetime slot, wasting no time announcing the show had been axed. The series did have its fans early on, such as The Independent’s Brian Viner, who praised the show as well written, smartly directed and splendidly acted, words which now adorn the box cover of the two disc Blu-ray edition and which he may well have regretted a couple of episodes down the track. 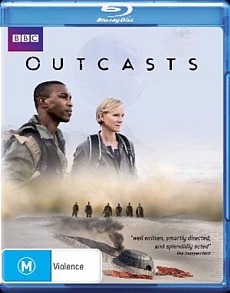 The special effects are frequently stunning and fans of the genre fill find much to recommend Outcasts. Ultimately though it’s rather niche and far from engrossing, and, worst of all, fails to live up to a premise that should have been thrilling and rife with drama from the outset.